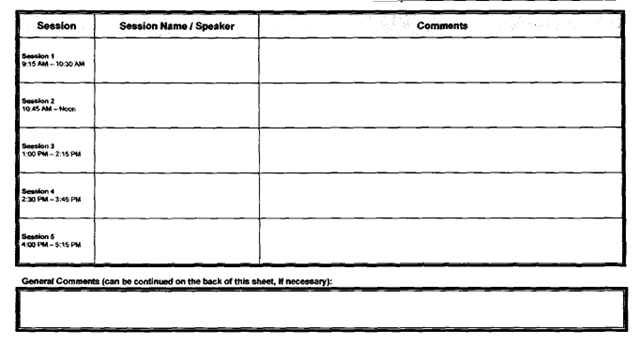 Rather than individual forms being used for each session, each attendee was given a single form (the relevant portions of which are reproduced below) and asked to keep it with them as they moved from session to session throughout the day. Attendees would fill out the relevant info as they attended each of their desired sessions and return the completed form to the organizers right before the SWAG raffle at the Closing Session. Would attendees be comfortable completing a non-anonymous Eval Form that had their name + email address on it? 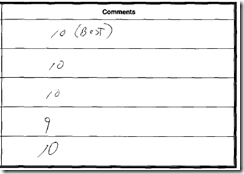 Would attendees take the time to write anything useful in the comments section since it takes so much more time to do that than simply circling a number from 1-10 in response to predefined questions? Gratifyingly, the answer to both of these seems to have proven to be a resounding YES. 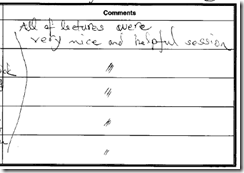 …but for the most part, the comments were both detailed and helpful for the speakers in re: the impressions of their sessions. 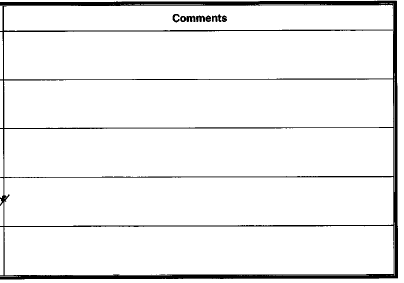 And yes, that last example where every comment was blank is from an actual submitted form – fortunately it was one-of-a-kind and all others were completed to a surprisingly high degree of detail. If you’re the one who submitted the ‘blank’ form, shame on you for cheating the speakers out of valuable feedback from you! Jumped around quite a bit. Would be more effective if built a much simpler example and built it line-by-line by typing the code as going (forced to slow down). Goal is to relay basic concepts and concept down to code. Too fast to the point that large part of the audience seemed not to follow. 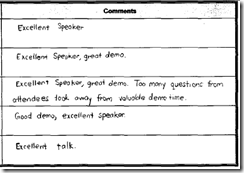 Speaker knowledge obvious – presentation weak. Very good speaker. Humorous. Presentation could have used more attractive examples. Exaggerates a bit. Not sure what was unattractive about the examples, but I’ll just leave it at that! Wow. Nothing else can be said. Seriously, wow. Sorry I missed that session! Sucked. Left after 10 min. Apparently glad I missed that one! Great and informative session. Info was immediately useful in day-to-day work. Probably one of the most complimentary things you could say about a session. Immediately useful value! WIN! Lots of code; in depth – may not be appropriate for absolute beginner (me) in the topic. Speaker is passionate and tries to convey as much info as possible. Great content – well focused, deft handling of questions. Sith Lords = Great Presentation. Love the reference to the Sith Lords in that one! Good info. Presenter needs to tailor slide deck such that code examples are reached more quickly. Too many questions generated by theory. When running low on time he should be willing to hold questions. 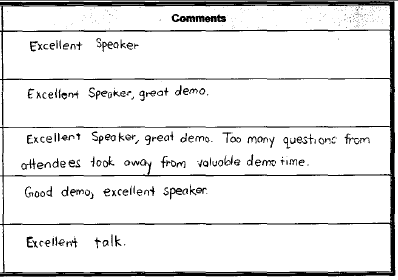 Again, specific feedback providing actionable intelligence to the speaker. What went wrong, suggestions on how to perhaps deal with it in the future. This kind of feedback is invaluable to a CodeCamp (or any other!) speaker when trying to improve their delivery! Funny and entertaining. Would have preferred covered more data and less styling. Amazing. He knows what he is talking about. Ouch. Sounds like a mis-match between expectations and delivery in there somewhere 🙁 More work to do! Content is good. The delivery is too detailed. If using a simpler example, it would be better. 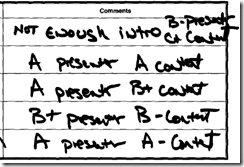 Again, specific detailed commentary that a speaker can actually use to improve their delivery! Great stuff! For those with near-consistent positive or negative feedback across many attendees comments, I think its reasonable to take that on its face: each such session in question probably was generally either ‘good’ or ‘bad’ and the speaker should either be satisfied with their session or should probably consider rethinking their content, their delivery, or perhaps both depending on the comments. 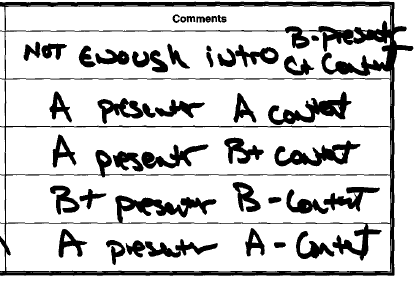 This is where having detailed comments really shines in re: value for the speaker: if a speaker really wants to improve their presentations for the future, then they should have little doubt about where to focus their energies based on the detailed comments from attendees. Interesting presentation, very knowledgeable presenter. I did not like the way the material was presented. This presentation was AWESOME. This is the kind of presentation that I will be reviewing as soon as I get home. It was chock full of deep/rich content. The presenter was smart, cool, and funny! Wish this was taped! This wide disparity in feedback points to one probable underlying cause: a mismatch between some attendees’ expectations for the session and the session’s actual content/delivery by the speaker. 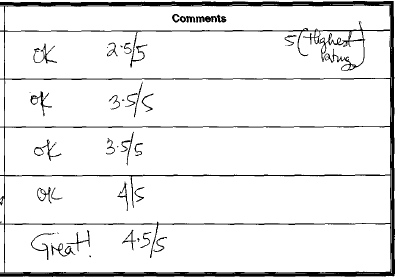 The preceding four comments are all from one of our more advanced sessions/topics of the day, but a similar pattern in disparity of feedback was observed with the comments from some of our more ‘beginner’ or ‘entry-level-introduction’ sessions too. The one common thread identified from the parsing of feedback from such sessions strongly suggests that the disconnect is the result of insufficient indication in session abstracts as to their expected ‘level of difficulty’ (or expected prerequisite knowledge) for attendees. I routinely do #2 on all my session abstracts submitted to anywhere I am planning to speak and even though it sometimes makes event organizers ask “Would you mind trimming your abstract down to just a paragraph so we can post it now that its selected?”, I still feel its valuable to be able to define my own expectations for the skills my audience should have to get value out of a session I am delivering. Target Audience: .NET developers interested in learning how what sometimes seem to be abstract OO design principles can actually be applied to improve the structure and flexibility of their own code. The ideal attendee will have several years of .NET (or other OO language) development experience on at least moderately complex systems so that they can recognize the pitfalls of OO design that the S.O.L.I.D. principles are attempting to address. The ideal attendee will have several years of object-oriented software development experience on the .NET platform. Familiarity with Interfaces, Classes, inheritance, and polymorphism are assumed. Exposure to common .NET 3.5 constructs such as lambda expressions, anonymous types and methods, and extension methods are required. Attendees should also have had some prior exposure to the mechanics of writing unit tests, although not necessarily in a Test-First/Test-Driven context. Familiarity with IoC containers and dependency injection techniques on the part of the attendee are helpful but not required. I think that if we are able to elicit this information from speakers in addition to simply a description of the content of their session, then it might be possible to mitigate some of the impedance mismatch that’s never entirely avoidable between sessions and attendees. Let’s call that ‘Lesson-Learned’ and file it away for next time. 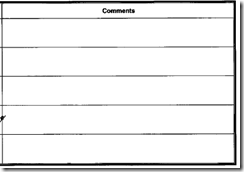 A couple of the evaluation forms deserve ‘Honorable Mention’ for a variety of interesting reasons. 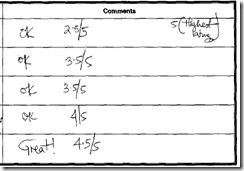 Here’s one where the author’s handwriting looks suspiciously like MS Comic Sans and it stood out well in a stack of forms with terrible handwriting! Kudos to this person for the high-legibility of their handwriting – it would have taken me perhaps 2+ hours to write that so clearly! And lastly, here’s one that caught my eye as not only receiving ‘5-Stars’ but apparently earning them in a special pattern too! Overall it was a fun and informative day. I’m looking forward to VS2010 now more than ever! I’ll definitely be back next year and I’ll recommend CodeCamp to my friends and co-workers. 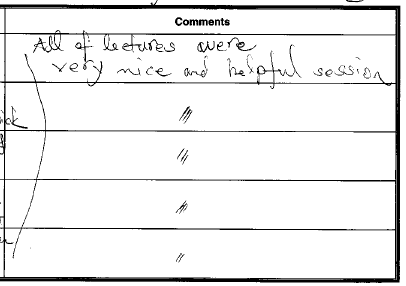 Feedback like that makes all the hard work worthwhile, so to all those attendees who took the time to write detailed, informative, actionable comments on their forms I can 1000x assure you that every comment was read, evaluated, and internalized by both organizers and speakers alike! Thanks so much for taking the time to offer thoughtful, useful input to everyone involved! I was very gratified with the responses. I’ve read some random comments (did you see that person who wrote an entire page of general comments?). I’m going to read all of them this week. I’m really thinking that eliminating ratings makes for MUCH more useful feedback, and based on this, we’re definitely changing how we do things at Fairfield / Westchester. It should not be a competition — these events should just be a great learning opportunity for everyone — speakers included. Competitions are great for “Speaker Idols” (a terrific event in its own right), but if we can get feedback like this, it’ll just help everyone improve. Just to clarify a bit — the attendees were not informed that the evaluations would ultimately be anonymous when we sent them to the attendees. 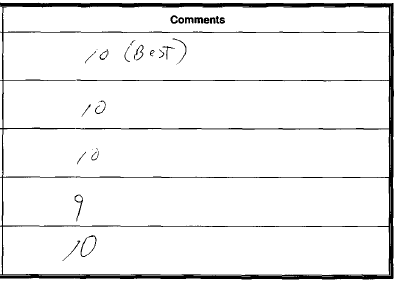 Despite that, we had what appeared to be really honest evaluations. I wonder how people would respond if they knew they would end up being anonymous (I stripped out the names and email addresses before sending them to the speakers — we just used those for the raffles). Hopefully, they’d remain constructively critical. That would be an interesting experiment for next year, if we do mention this in the opening session. I agree 1000% (yes, 10x more than what you say 😉 ) that we should ask speakers for the level and prerequisites next time. Your own abstract was great, and should be used as a model for others. As you mentioned, it does help to have an abbreviated version for posting on the wall, though. Next Post: How Do *YOU* Think About the Problem?